Use of wax at each stage of the grafted grapvine production process. QUIMIWAX microcrystalline waxes have been developed thanks to La Compagnie Franco-Continentale des Lubrifiants, (CFCL), a French company which was first settled in 1932 in Bordeaux, France. Up to July 2013, CFCL has been the exclusive distributor of QUIMIWAX waxes for 20 years until it actually closed down. Since July 2013 Wax & Graft has taken over the exclusive distribution of QUIMIWAX grafting waxes. QUIMIWAX grafting waxes are now used by vine nurseries all over the world (more than 25 countries on all continents). QIMIWAX waxes are microcrystalline waxes. Microcrystalline waxes are a type of wax produced by de-oiling petrolatum, as part of the petroleum refining process. In contrast to the more familiar paraffin waxes, microcrystalline ones are small and thin, making them more flexible. The micro crystalline waxes have a molecular system which is larger than paraffin. The melting point of a crystalline solid is the temperature range at which it changes state from solid to liquid. At the melting point the solid and liquid phase exist in equilibrium. When considered as the temperature of the reverse change from liquid to solid, it is referred to as the congealing point (ASTM D-938). The melting point is a very important matter for our specialized wax which ensures an effective protection under very hot climates. It then prevents the wax from melting. The procedure described here measures the temperature at which a sample being cooled develops a “set” or resistance to flow. 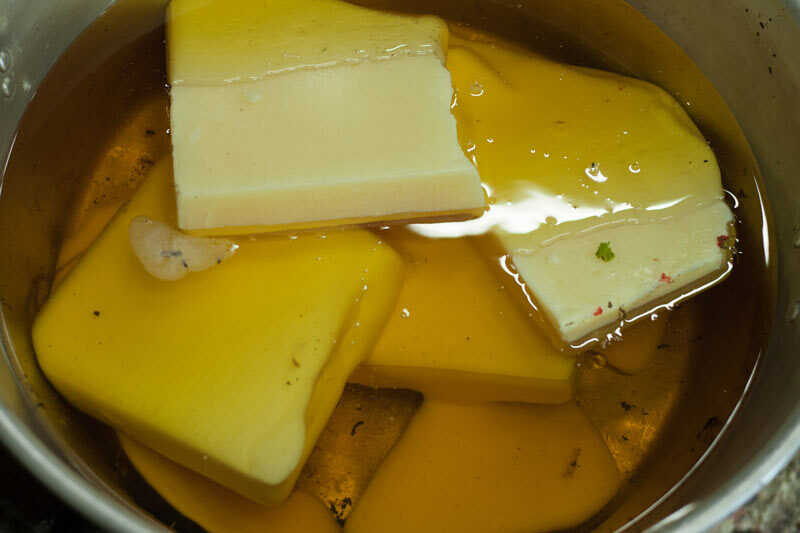 At that temperature, the wax may be at or close to the solid or semisolid state. Viscosity is a measure of the resistance to flow of a fluid. Viscosity is very important as it would ensure the wax adherence on the grafted plant. This test assesses the consistency and the hardness of the wax. It determines the wax elasticity. It is also very important as when the callus grows, a flexible wax will stick to the plant and therefore will keep protecting it without cracking and therefore leaving it uncovered. For grafting and reparaffining operations, the ideal oil content should not exceed 3%. Quimiwax makes a very strict selection of microcrystalline waxes so that oil content is usually below 2%. A high oil percentage would harm the plant and burn it so it is very important to keep it low. QUIMIWAX waxes are availabe in 3 main colors : white (pale yellow), red and green. Grafting in viticulture is a practice that resulted from the devastating effects of phylloxera, that ravaged vineyards throughout Europe at the end of the nineteenth century. After a number of attempts to fight this pest, a definitive solution to the problem has been found in the creation of double-member phylloxera-resistant individuals by using the grafting technique, which calls for a scion (portion of a shoot) and a rootstock . 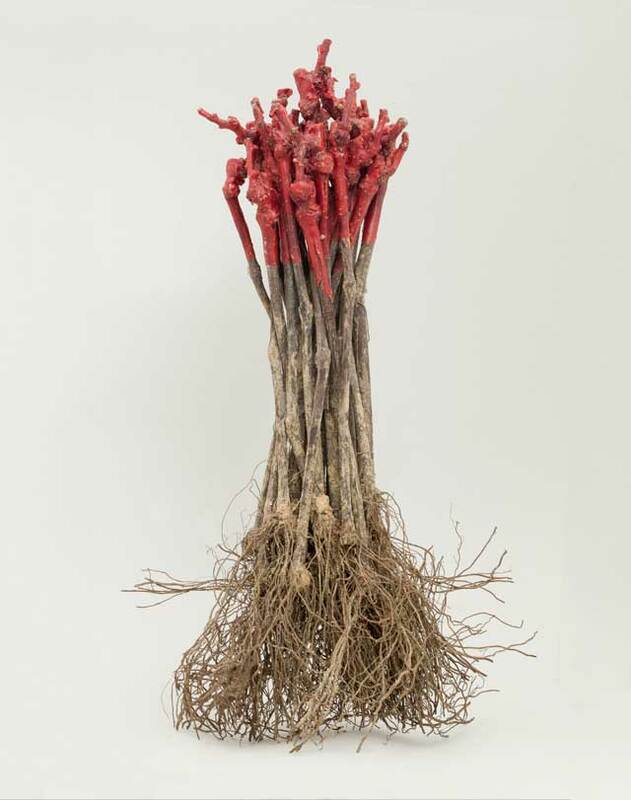 The result of the union of the scion and a rootstock is the the final grafted rootstock ready for being planted. The most commonly used grafting method is the omega cut grafting, which gives a high rate of graft take, between 67% and 78%. Omega-cut machines have then been developed and are until now largely used in nurseries. The most important is that the interface, i.e. boundary zones of both the cutting and the scion are as large as possible and fit perfectly together. The grafting process includes three stages where wax is used. Dipping of grafted plants in ACTYGREF. Wax is melted in a special wax device with electrical thermostat. The waxes used to protect the first stage of the plant development must have high elasticity but must not retain peat, sawdust or other materials used in the driving phase of the callus. The melting point for this phase ranges from 68 - 72 °C, and the temperature of the melt should be maintained at 75 - 80 °C. protects the graft from infections and secures the callus development. ACTYGREF improves the health of the grafted plants of about 5% in comparison with the other waxes used for grafting. It particularly protects against Botytris Cinerea, which develops during the storage period when the plants are kept in the warm chamber. ACTYGREF helps developing both the buds (where the callus has been formed) and the roots during the stratification period (also called ‘forcing’ period). Stratification or callusing is the process of pretreating seeds to simulate natural conditions that a seed must endure before germination. Grafts, once waxed, are then put in callusing boxes (about 2000 per box), dampened and then filled with wooden chipsto retain water ( or just put in boxes with water). 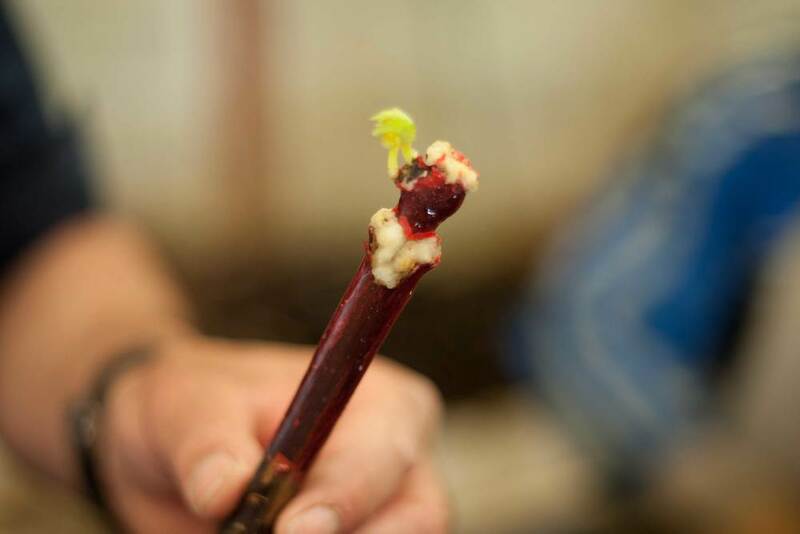 ACTYGREF is applied after grafting and before callusing. The freshly jointed plant is transplanted from the growing box to the nursery fields. 80% of the grafted plants are actually transplanted in nursery fields. The remaining 20% are transplanted in containers (FERTIL or JIFFY). The important function of the wax at this stage is to prevent the plant tissue from drying out until the graft union is completely grown. In addition the wax must provide the plant with sufficient conditions for transpiration. The physical properties of the wax applied on the graft before is moved to the field must be a balanced compromise between hardness and elasticity. It is important that the wax does not become too soft and lose its structure in the sunshine. CIRKA is used for plantation. It ensures an effective protection against climatic and mechanical actions. Under hot temperature, its high melting point gives a complete security. It does not soften nor flake off and it keeps a good plasticity and impermeability. CIRKA is widely appreciated by our customers for its reliability and its capacity to improve the degree of graft union. Another wax can also be used for plantation. STARWAX is a micro-crystalline wax with a high melting point, which is made of micro particles of light metals which reflect 90% of solar or artificial rays, ambient UV and IR rays. A perfectly neutral and non phytotoxic additive provides a homogeneous, deposit free product. STARWAX brings effective protection for the callus and young vegetation. On plants leaving the stratification stage, it helps reinforcing the callus and stops the effects of sun burn. Its use is particularly accurate in countries where sunshine is strong and UV effects could be damaging. It is the ultimate phase of the grafting process. 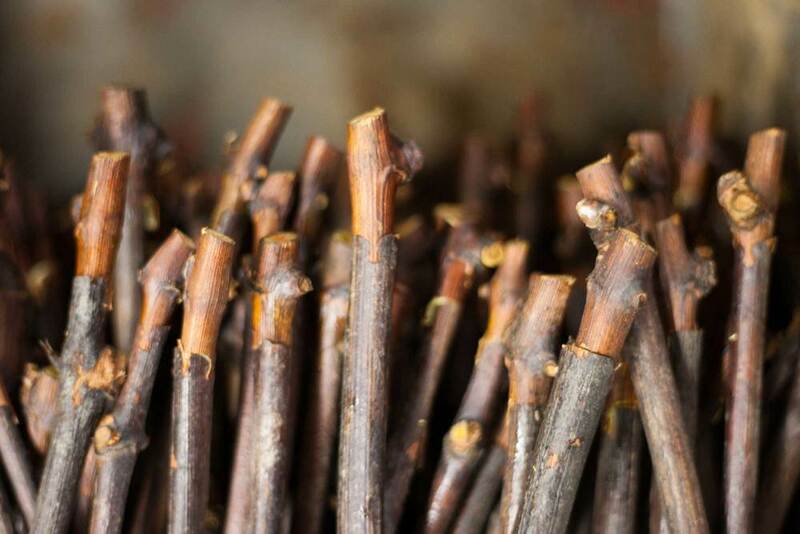 The grafted vine plants are uprooted and waxed for the last time before they are stored in a cold room. They will eventually be sold and delivered to the viticulturists. (available in white, red and green) gives flexibility and adhesion to the plant at the low temperatures inside the climate chambers to avoid peal off during storage. Also the wax film must be intact when the plant is finally transplanted in the vineyards. Grafts are gathered in bundles of 25, then packed in special plastic bags and boxes. These boxes will be placed in cold rooms until they are eventually delivered to the customers (viticulturists). The aim of this document is to help you understand the grafting process and the use of wax.